The Bachelor of Design in Architecture by itself does not lead to professional recognition as an architect. To become a professional architect, students must complete this degree followed by the Master of Architecture (C04235) (an additional two years of full-time study or equivalent). The Bachelor of Design in Architecture is the first of two degrees needed to become an architect. Students wishing to qualify for professional recognition as architects must also complete the Master of Architecture (C04235). Through the Bachelor of Design in Architecture, students learn what it means to be an architect in a globalised world. This is achieved with a focus on how the profession can shape global cities through complex spatial thinking. The first step is to deprogram preconceived ideas of architecture. Such an approach lays the foundations for creative spatial and material awareness, pushing the boundaries of traditional architectural practice. UTS takes a hands-on approach to digital design and fabrication: students learn the software, material and model-making skills required to translate thought into form, right from the start. They have the opportunity to work on real-life projects and engage with stakeholders such as the Powerhouse Museum, ABC, Sydney Harbour Foreshore Authority (SHFA), and Sydney Olympic Park Authority. Students are globally connected, with opportunities to study in, work in or visit cities such as Berlin, Los Angeles, New York and Tokyo. They hear from international experts through guest lectures and are connected to global competitions and scholarships like the Costenino Design Challenge or Frank Gehry internship program. UTS Architecture is a young and vibrant architectural school, working from one of Australia's newest, leading-edge campuses. Its staff are actively engaged in the industry as practitioners and commentators, while its 24-hour studios are always abuzz with students who live and breathe architecture. This degree provides a liberal introduction to the study of architecture as a discipline. Students gain a critical and ethical awareness of architecture as a discipline with much to offer in the face of many of today's most pressing societal challenges. It equips students to join other design fields or related disciplines, and it prepares students for the Master of Architecture degree. Career opportunities include architect (after completion of the Master of Architecture), urban designer, project manager, administrator, policymaker, researcher, educator, journalist, and disaster relief and international aid professional. Successful completion of the Insearch Diploma of Design (Part One) (DDP1) with the required WAM of 70 per cent guarantees entry into this course without recognition of prior learning. one page is a 300-word (max.) statement of intent; the statement of intent should describe the applicant's academic background and how past work experience relates to the intended field of study. The course duration is three years of full-time study (or equivalent). Year 1 must be taken in full-time mode. The course comprises a total of 144 credit points. The normal full-time load is four 6-credit-point subjects a session, totalling 48 credit points a year for three years. Year 1 comprises four compulsory 6-credit-point subjects a session. 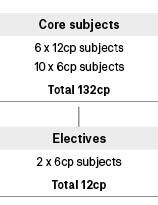 Years 2 and 3 comprise one 6-credit-point elective and three compulsory subjects a session. The subjects listed below represent the standard full-time course. Under certain circumstances, students may apply for exemptions from some subjects. The example program below is for a student commencing in Autumn session and undertaking the course full time. The Bachelor of Design (Honours) in Architecture (C09048) is available to meritorious students with an additional one year of full-time study. Students who have successfully completed this course may proceed to the Master of Architecture (C04235) as continuing students, provided they enrol in the next academic year after award of the degree, or seek leave of absence for no longer than one academic year after the award. The Bachelor of Design in Architecture followed by the Master of Architecture (C04235) is accredited for professional recognition by the NSW Architects Registration Board, the Australian Institute of Architects and the Commonwealth Association of Architects.